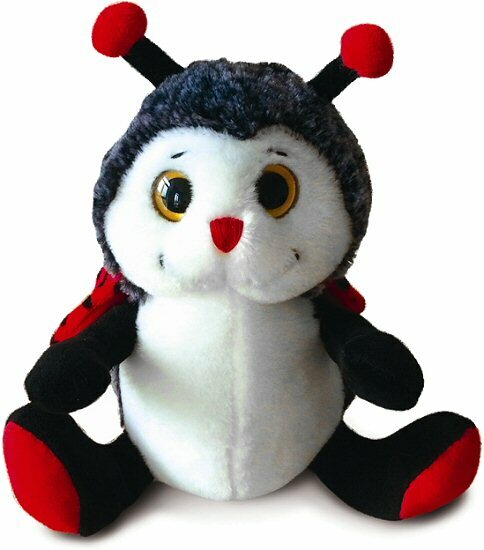 This adorable Sitting Ladybug Super Soft Plush animal cannot wait to join you for hours of imaginative adventure. Just like it's name implies, the fur on this lady bug stuffed animal is super soft and the special white-tipped black coloring adds a fun extra dimension to its personality. With a cuddly body, soft white face and tummy, black legs with red feet, fun antennae, and black spotted red floppy wings, this plush ladybug has large metallic yellow eyes that seem to follow you around the room. Fun Facts about Ladybugs: Did you know that farmers love ladybugs because they help keep the population of plant-eating pests low? It seems they have quite an appetite for such destructive creatures.